Irish national team coach Toni Gerona has named the Ireland squad for their EHF EURO 2016 qualifiers against Belgium and Estonia. The matches on 4 and 6 April will be the first EHF EURO qualification matches to be played in Ireland and this represents a historic occasion for the sport in Ireland, which general manager Lúcás Ó'Ceallacháin believes shows the development of the national team. “There has been a change of culture in the team over the last two years, with the support structure and mentality of the players moving from amateur to professional. “We hope that these games will be the first of many as Ireland become a regular fixture in qualification for major competitions,” said Ó'Ceallacháin. Ireland faced both Estonia and Belgium in that past year, suffering heavy defeats in both games, but captain Alan O’Brien feels that facing both teams again so soon gives the squad an opportunity to show how far they have come. “This is the first real test for us. We have made a lot of progress over the last year and it is time to show that, these games are a perfect benchmark for us,” explained O’Brien. 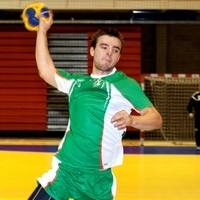 A number of development projects have been running at the Irish Olympic Handball Association and one of these projects have produced their first results in the national team. A foster programme with the Danish Handball Federation has helped the Irish develop a structure in the national team which is similar to that of the top nations as well as development structures to increase the potential of players in the future. The ‘Green Giants’, an EHF SMART programme, is a talent identification programme which has been targeted at players from other sports who have the qualities to play handball at an international level. Two players in the squad, Breandán Ó Riain and Peder Madsen, have come from the programme and are expected to get their first real taste of handball at this level. The squad will also be strengthened by the return of Alim Khaliq and Chris O’Reilly, who were missing from the defeat to Estonia in October 2012, while Alex Kulesh, Brian Campion and Kevin Murphy are out of the squad due to injury. Ireland are facing two teams with more experience at this level and Ó'Ceallacháin knows that results are not the priority at this stage of the team’s development. “The level is incredibly high and we have no expectation to win, the goal at the moment is to gain experience of playing against these teams. “This is a very small step in a long journey. The focus will be on our own performance and ensuring that we improve on the past, that will signal progress,” concluded Ó'Ceallacháin.